Being new to antique and vintage fans, I'm not sure what to call this switch, but it is the lever three speed switch. This switch is missing in an antique fan I recently purchased. Is there somewhere I can purchase a reproduction or something? Posting pictures of the fan will help identify what you need. What is the make and model of the fan? Is it a rotary switch or a pullchain switch? If its a rotary switch then its more than likely either a Cutler Hammer Switch or a switch that was similar to the Cutler Hammer Switch that was made by one of their competitors that was used in a lot of different fans from the 1940s until the 1960s. If it was a pullchain switch it was a Levolier Switch which is nearly impossible to find one in working order as they basically deteriorated over the years and then fell apart. either way there are modern replacements for both types of switches and usually you can get them at your local electrical supply house or Grainger would have them as well. Below is the three way switch that can be found at Granger for $6.40. Works very well and replaces the switches typically found on 1940's GE Vortalex fans. It is one of the lever switches. Here's a picture of where it should be. At some point in the past, the switch must've broken and an owner wired the motor directly to the power wire, so it comes on when plugged in. What size & brand of fan is it? There are a whole lot of different switches. Is the speed coil still in the base? I'm guessing that it is missing if the previous owner wired the head directly to the outside current. In any event, the two head wires would seem to indicate a fairly straightforward wiring diagram. Perhaps you could take a picture of the motor tag which would give us the make and model number. 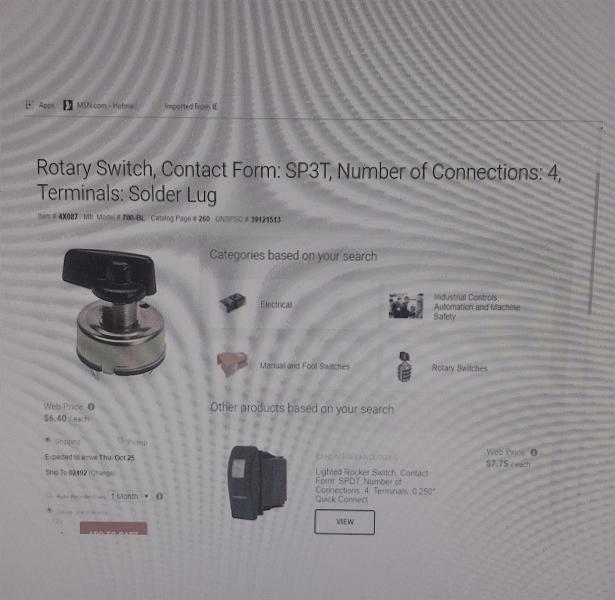 Then you can post on the WTB (wanted to buy) section of the forum for a replacement. Depending on the make and model number, you are probably talking about something less than $100 for a replacement speed coil. The picture above shows that you are missing the rubber feet which you will need so you don't scratch up your furniture. Those can be ordered from AFCA member Darryl Hudson. This is just an old 8" Busy B fan. Nothing fancy or anything. It would probably make more sense to put a different kind of switch in it, rather than spend $100 on a replacement switch, right? Don't know Tom. Back up and take a full picture of the fan so we can see. Someone might have a replacement switch for you for very short money. The members are a great group of people who are very accommodating and might give it to you for the cost of shipping. I've done that on many occasions. We all strive to maintain as much originality on restorations as we can if we can find the parts. Does this fan have a motor tag that you can share a picture of? It won't run just on a three speed replacement switch without the speed coil. That's what provides the variable resistance that is responsible for the three speeds. You have nothing to lose by asking on the WTB part of the forum. You may have to join the AFCA in order to post on the WTB / WTS section (not sure about that). I have made some wonderful friendships in this club so I highly recommend that you do. Great benefits for very short money! True. It is worth a shot. Here's a picture of the whole fan. There isn't a motor tag on it anywhere. It's just an old dime store fan. You can find out a lot about this fan by using the search function on the forum. This fan probably dates to the late 1920's or 1930's. It was manufactured by the Kelmet corporation. Russ Huber (another AFCA member) might have some good information about this lovely fan. I found a post from Russ that stated: "Fans were branded as Polar Cub, Gilbert, or Busy B. 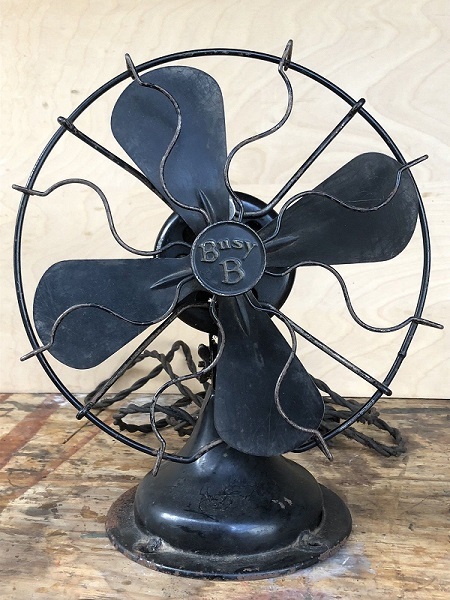 Busy B fans were manufactured in the Gilbert factory, but were products of Kelmet Corp., a captive company of A.C. Gilbert’s in the 1920s" Your fan looks to need very little in the way of restoration. You could probably just clean it with WD40 and use some Maquiars Auto polish and it would look very nice indeed. It's worth getting the right speed coil so that it runs the way it was designed to run - on three distinct speeds. Not much heavy lifting there to make it look super nice! Thanks, David. I'll check with him. Unfortunately, the blades wobble and there is too much back and forth play on the shaft. It vibrates a lot, so the blades are obviously out of balance. Hopefully, I can correct those issues; although, straightening and balancing fan blades may be beyond my current skillset. Back and forth play of the kind you are describing usually indicates a worn bearing, or it may be a simple matter of adding some fiber washers on the front of the rotor to reduce the forward/backward play. You can try balancing the blades by eye. There are ways of balancing blades that can be done if you use the search function. I usually just slowly rotate the blade to see if there is one blade that is out of plane that can easily be corrected. Try that to see if it reduces the vibration. Are you sure it'd be a three speed switch? I wouldn't be surprised if this small dimestore fan had only a single speed on/off lever. I have never seen one of these fans but Russ Huber would know for sure. You are correct, Gunnar, it is a single speed switch and it was just not in its slot. I took the base apart and the switch was still in there. Straight simple switch, too. All's well that ends well! Love to see pictures when it's all cleaned up! Page processed in 0.2330 seconds (35% database + 65% PHP). 27 queries executed.